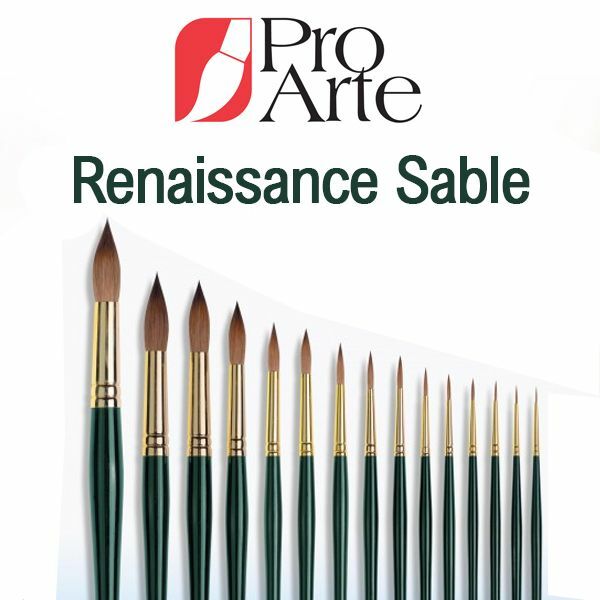 The Renaissance Sable range from Pro-Arte offers a pure sable watercolour brush that doesn't completely break the bank, coming in at up to half the price of its competitors offerings. Sable is well known for offering excellence in bristle quality, excellent colour holding and great spring, and is highly sought after by watercolour artists the world over. The dark green handles have been coated with gloss varnish to provide a sleek finish with a comfortable hold, as well as a gold ferrule for that extra touch of elegance. There are three brush types available in the Pro Arte Renaissance range - a flat, a round and a rigger - and a variety of sizes available in each making this range of brushes perfect for a wide range of styles and applications, depending on your needs.